Whether you have something that needs fixing or can volunteer to help, come down! You are looking at the regions first repair cafe! You’ve asked for it and we have responded. 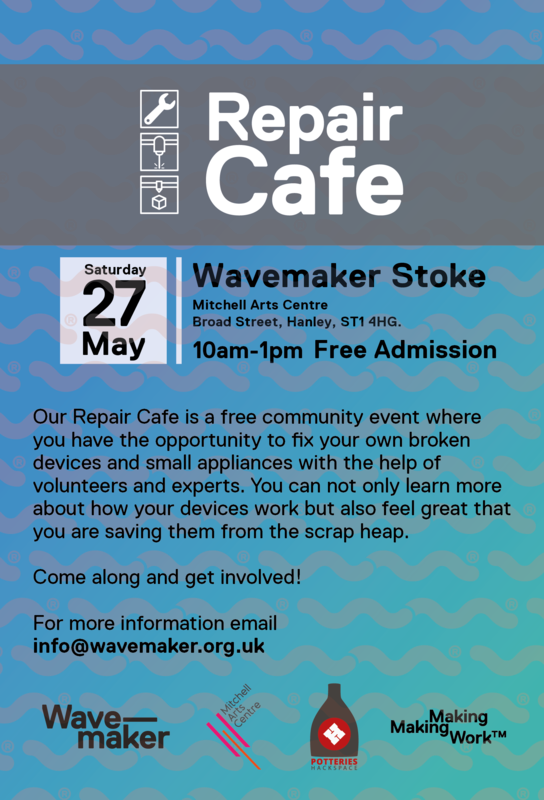 Wavemaker are teaming up with Potteries hack space we are proud to bring you our first Repair Cafe. Bring your broken, electronic items, toys, devices and anything that will challenge our team of super hackers and electronic wizards. Note, this isn’t a drop off facility, this to give advice and help you fix your gear. The event is FREE and is kid friendly! Woop woop! So come and have a coffee and a mingle. So, what are you doing on Saturday 27th May? We’re hosting a restart party at the Mitchell Arts Centre Cafe, Hanley. A Restart Party is a free community event where volunteers help people fix their own broken electricals and electronics, to save them from waste and change our relationship with electronics. Also, if you want to know what to bring, please see our equipment list. Our Repair Cafe is a free community event where you have the opportunity to fix your own broken devices and small appliances with the help of volunteers and experts. You can not only learn more about how your devices work but also feel great that you are saving them from the scrap heap.